Very True..The power from within is key. 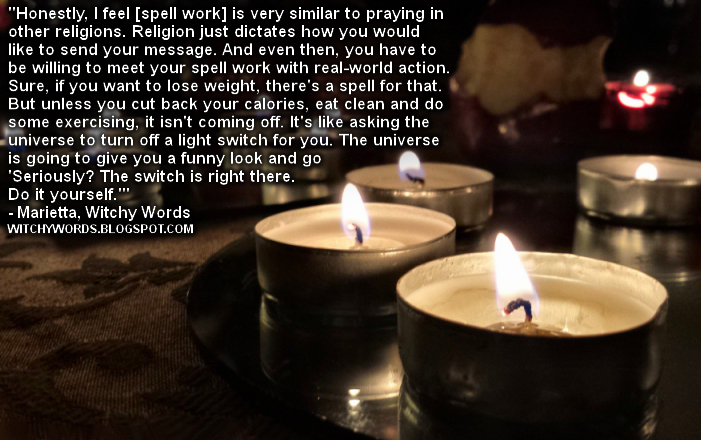 I look at the same way you do... that spell work is praying.. the only different between US praying in other Religions is we know how to use and harness the energy to get results.. So to lose weight I need to cut back on my calories, eat clean and exercise? So the `spell`is absolutely superfluous? The result would be the same without the spell, so what`s the point? Why do you insist that magic is real when it very clearly isn`t? Anon, this website is for practitioners of witchcraft. If you don't believe in witchcraft then this website is not for you. I am open to all possibilities but I think I asked a logical question. I may have put it a bit bluntly but if magic can`t actually affect anything then is it worth doing? I don`t mean to be offensive so It would be great if you could let me know your take on it. I responded to your other comment with a link. In the future, avoiding patronizing and dismissive language would get more engaging comments. believe it or not Marietta I have felt drawn to Witchcraft for some time and I really can`t explain why. My logical self takes over and decides that it`s silly then I find myself drawn back to it. I would really appreciate you explaining the `why`behind spells. It sounds like the derisive language you've used above is a projection of your personal internal war. Again, I would suggest looking at the link I sent you. I believe that magic is highly psychological, putting you in the right mindset that opens more paths simply because you're actively looking for them. Thanks for the link. I have been having a wander around your site and, with all due respect I cannot find anything of substance. All I find are rituals, spells, get togethers with friends and, I`m sorry to say it again, clutter. I feel there must be something more to Witchcraft than this. It`s all very nice but, to be honest it`s (or your version of it anyway) all a bit homespun and twee; it seems to me to be all style and no substance, almost like you are having rituals just to fill some time. You could just as easily run a craft club or coffee mornings or a knitting club! As I said previously what is left if you strip away the rituals and the altars? (I know you say it`s all part of your practise but why?) I feel that, in your case witch is what you do, not who you are. Does having 100 candles and all the Witchy paraphernalia make you feel like a witch? What is the `everyday`of Witchcraft? (That`s a rhetorical question; no need to answer) .If the rituals and spells are the icing, what makes up the actual cake? Obviously I know Witchcraft isn`t all `Practical magic` and `the craft`, but ultimately everything you do seems very `suburban`. There doesn`t seem to be any connection to nature; there`s no wildness, no freedom. Everything is too measured and exact-this candle for this, this stone for this, say this, do that. I wish you all the best in everything you do, but your version of Witchcraft is definitely not for me. You're being incredibly disrespectful to my practice. Clearly my craft has substance or I and others wouldn't connect with it. If you would look, you would find that my craft revolves around cycles, be it of the year or of life and death. If you would look, you would see that I revel the gray area. And if you had read any of my articles such as "Your witchcraft is not my witchcraft," "Forgiveness does not make you morally superior," or looked at my ritual for Samhain which involved shadow work and meeting with your inner self to destroy the ego, you would see exactly what my craft is. Instead, you're convinced that witchcraft aesthetic is something to be denounced. If my craft is psychological, the aesthetic is just as much a part of it as is anything else I do. It puts me in the right mindset. Just because it's not for you doesn't mean my craft is invalid, superficial or "pretend." You clearly need to do some personal work as you cannot come to terms with your own beliefs and are projecting those insecurities onto others who are comfortable and secure in their practice. Come back to my blog when you can speak with respect.